- Department of Fine and Applied Arts, in 1978 with a BFA in Environmental Design. She spent a year with Xerox as an Industrial Designer before striking out on her own as a freelance illustrator. In 1993 she became President of Haywood and Sullivan, a web/graphic design firm with national clientele; currently she is a partner in the firm specialising in fine art and photography creation and management. In 1992 she had her first outing in the Pastel Journal in a piece titled “Massachusetts artist turns from technology to art”; she has been back in 2007, 2010 and 2011 in illustrative pieces demonstrating her mastery of skies and atmospheric effects. She has also appeared in The Artist’s Magazine, American Artist, and American Art Collector. Liz has been showing her work and winning awards since her auspicious foray into the medium, including most recently the Diane Bernhard Gold Medal for Excellence, 127th Annual Salmagundi Members Show, 2010; the Connecticut Pastel Society “Renaissance in Pastel” Annual National show, Best in Show 2012; and the Salmagundi Club, Annual Fall Auction top award, 2012. 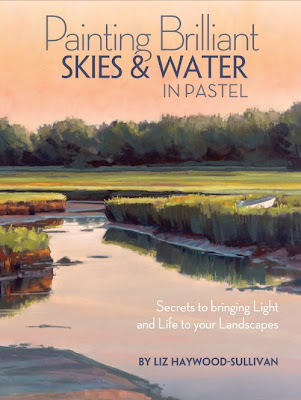 Liz is in demand for her pastel teaching, and has issued a number of instructional DVDs including Painting Realistic Landscapes in Pastel; and Water & Reflections – Painting Realistic Landscapes in Pastel – both available from Northlight Books. She has made use of her teaching experience to author a new book on pastel – always a welcome event (see below). Liz is currently the President of the IAPS (International Association of Pastel Societies). She succeeded to the post after the untimely death of Maggie Price, co-founder of the Pastel Journal. Painting Sunlight and Shadow in Pastel; Maggie Price; ISBN 13 9781440303913. Navigation: Navigation is straightforward - you can easily see the paintings, which is the point of an artist’s website! Gallery: Atmosphere ; Environment ; Light. Image View: Large thumbnails enlarge on new page, where information in provided on the painting. Download is possible. Shimmer is a 20 x 36 ins. 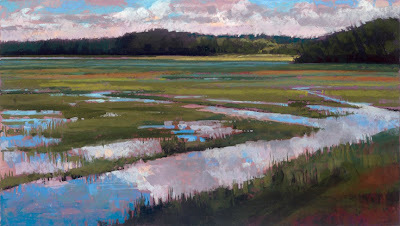 painting of the North River marsh near Liz's home in Marshfield, Maine. Demo/Blog: Not on the website; buy the DVDs and book! Bio: My first encounter with the work of Jon Friedman was in the pages of the Pastel Journal, December 2010. Now and again one has the jolt and the joy of seeing something unexpected, unanticipated, and frankly inexplicable in a medium with which one had become comfortable, one saw as predictable – and then some Friedman jumps out of the pastel box and shouts “Boo” – and don’t we all need this experience to keep us keen and fresh and on our toes. Jon Friedman attended the Corcoran Museum School in 1968 to study printmaking; the following year was spent in the Skowhegan School of Painting and Sculpture while taking his BA in Philosophy at Princeton. In 1971 he graduated from Cranbrook Academy of Art with an MFA in painting and sculpture. He was immediately appointed Visiting Lecturer in Art in Connecticut College until 1977, during which period he acted as Invited Lecturer in the Hirshhorn Museum, Smithsonian Institute. His resumé from then till now is too long to rehearse – you may see it on his website, but you may take it that his exhibitions, awards and representation in private and national collections are numerous and prestigious. However, briefly, I can say that Friedman's work is displayed in mural and sculpture form at the Nathan Cummings Foundation in New York; he was granted a Residency Grant at the Ossabaw Island Project in Georgia; and he was a University Scholar for Princeton University. He has held solo exhibitions in New York, Washington D.C., Chicago, and Santa Monica, California and his work is displayed in such prominent and diverse corporate collections as American Telegraph & Telephone, the National Academy of Sciences in Washington D.C., the American Broadcasting Company in New York, and Johnson & Johnson Pharmaceuticals. Technique : Jon Friedman uses all the tools at his disposal—everything from pastel and Flashe paint to sandpaper and a spray bottle—to capture his creative vision. C/f the Pastel Journal, December 2010 for more. Gallery: Paintings; Portraits (some pastels); Sculpture; Works on paper and Pastels. Note: there are sub-galleries in these categories; I am concerned only with the Pastel Gallery in this blog. Image View: Two pages of thumbnails that may be enlarged, and scrolled by clicking on image on screen. Information in provided in column on left of screen. Download is possible. 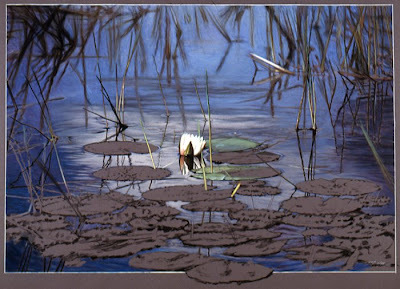 Solitary Lotus is 48 x 66 ins., 700 x 506, 82 KB; Charcoal and pastel. 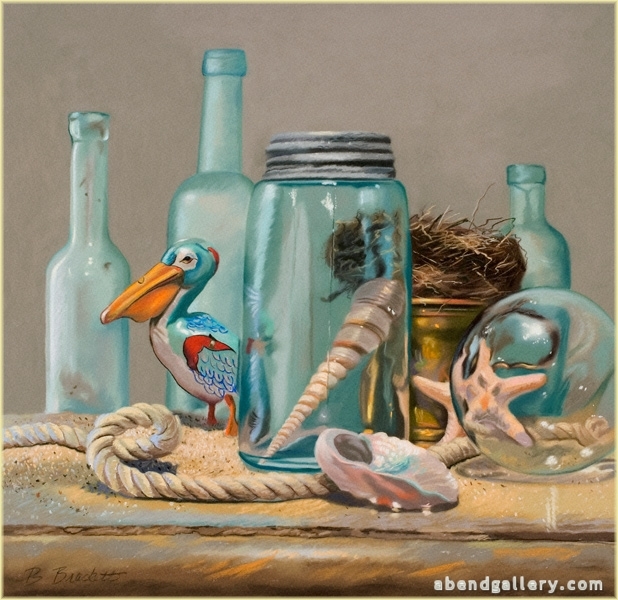 Bio: Brennie Brackett has been practising painting in pastel for nearly 20 years, and her mastery of the medium shines through her work. In 2002, Brackett was awarded the status of Master Pastellist in the Pastel Society of America. She is a Signature Member of the Pastel Society of the West Coast, of the Society of Western Artists, and the Marin Society of Artists. She has been the recipient of numerous awards in regional, national and international exhibitions. Brennie’s work has been featured in the Artist’s Magazine; Pure Color: The Best of Pastel (North Light Books); Les Maitres du Pastel - Le Livre 2011, Diverti Publications and Pastel and Pencil Artists of the South Mendocino and North Sonoma Coasts. She was the cover artist in the Pastel Journal, December 2009, wherein she had a revealing conversation with Sarah Strickley. Brennie's still life paintings tell stories that may be quirky or intriguing, but certainly full of interest and originality. Her stone series reads like a screenplay of the objects depicted. Her animal paintings are equally accomplished and formidable, if seemingly from the atelier of a completely different artist. It is no surprise that her paintings are in private and corporate collections throughout the United States. Brennie Brackett lives in the hills above the Sonoma Plaza. Her gallery is tucked away in the maze of shops and galleries at 27 East Napa Street, and located in the historic J.G. Marcy Stable built in 1886. Medium: Pastel; oil. Brennie generally uses Wallis dry-mounted to Gatorboard and her favourite pastel brands are Unison, Girault, and Diane Townsend. Her most treasured (artistic) possession is a three-tiered box of Meng Pastell-Farben made by Muller and Hennig in Dresden in 1874! Gallery: Visions/revisions; Still Life; Animals; Stones. Image View: Thumbnails may be enlarged, and scrolled or viewed by choice by keeping the thumbnail option active. Images are shown in Flash and may not be downloaded. Dimensions are not consistently provided. Nick’s Cove is 24 x 25 ins.